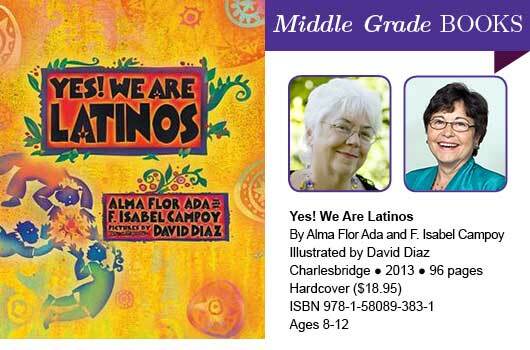 In this boldly illustrated hardcover book, 13 Latino children are introduced with poems about their lives in the United States. Juanita is from Mexico, but her native language is Mixtec. When she is enrolled in a school in New York and placed in a bilingual class, her teacher speaks to her in Spanish and tells her she will be learning English. Monica lives in Texas and has come from El Salvador to reunite with her father after an American woman helped her to illegally cross the border. Gladys is Puerto Rican and lives in Philadelphia. She hopes her father will change his mind about having a quinceañera celebration for her, and will instead allow her to attend college. Santiago is from the Dominican Republic and lives in Detroit. He wants to become famous and build a hospital for poor children back in his hometown. Sultana is a Sephardic Spanish Jew who lives in San Francisco. When her teacher tells her she should be proud to know two languages, she responds, “I am trilingual. I speak English and Spanish, but my first language is Ladino.” The rest of the children are Zapotec, Panamanian and Venezuelan, Spaniard, Guatemalan and Chinese, and Hispanic and Native American. After each of the poems, an explanation of the child’s ethnicity is offered, tracing it back to his or her country of origin. Intertwined with the histories of the countries is information about important accomplishments made by Latinos in the arts, literature, sports, and sciences. The last chapter describes the contributions that Latino culture has made to the United States. There is a bibliography for teachers and parents, as well as websites for students seeking more information. An index is also included. Caldecott Award winner David Diaz’s illustrations complement each of the poems perfectly, and feature exquisite cut paper designs in black and white, in the style of Mexico’s papel picado. Children, educators and parents will enjoy reading the poems and learning about each of the regions mentioned in the book.